Dana, your the first person that mentioned stripping the rachis. I have some that I stripped back in the '70's that I have had stored in a jar of glycerin. W.S. different subject, what do you use to thin Kelson's head cement and what is the liquid wax made of I know that odor but I just can't place it. Bob -Ted Niemeyer gets the credit for the duck rachis body - somewhere there is a description in one of the older books, I just can’t remember which one. Also, the bread crust is tied with a grouse rachis - very durable I might add...... i’ve never had one break. I wonder where I got the info, it must have been in Fly Fisherman mag. Bob, That's a substitute. The stuff I use smells like a pine forest. I have been tying with some hand stripped quills from Polish Quill in several dyed colors that I ordered from Competitive Angler during their sale. I really like the look of the stripped peacock quills dyed, especially the golden olive, olive and ginger colors. After I wrap the quills onto the hook shank I coat the quills with Loon UV finish then finish the fly. I also tried Sally Hansen Hard as Nails which works too, but you have to wait for it to dry versus the Loon UV coating that I just hit with my UV light. After getting feedback on my hotspot quill body from Roadkill, I've attempted a few others...the photography is poor...but I'm open to critique of the design, etc... i've fished the redhead hot spot and done well with it... if the weather will break, i'll give the other versions a try..
Dana ~ Please describe (and maybe illustrate with a photo or two?) how you go about processing a mallard quill. Specifically, where does it come from on the bird and how do you "strip" it? John ~ Your flies look really good to me. Nice tying. Bill - there’s no easy way to strip quills...... usually, I do the soak-clip-trim routine, but it is very time-consuming. Dana, can you describe how I might do this? Which feather does the quill come from? There's nothing wrong with the Polish Quills. I sometimes strip and dye my own but, it's quite time consuming...! Nothing wrong with that, just sometimes I prefer to crank out flies at a quicker pace. On the point of durability... we all know peacock is not the most durable material. I'm not sure how familiar everyone here is with UV resin. I know some here don't like to use it because it's not traditional, fair enough. The Solarez product called Bone Dry is a phenomenal product for coating quill bodies. When this stuff is applied, it's viscus is so thin that it literally soaks into the material. Hit this with a uv light and you've got a solid quill body. Add a thin second coat and you really have a rock solid fly. Plus it magnifies the segmentation of the quill, enhancing it's overall appearance. Love the stuff. Dana, your quill bodies are very nice indeed. I enjoy looking at them. I remember your fly wallet with the American style quill bodied flies... that was nice to see. My experience with UV resins is that they look great when the fly is first tied but 3-6 months later the coated part of the fly has turned fuzzy and milky (not clear). Have you used this particular product long enough to comment on this? The Solarez product I was referring to keeps it clarity and strength. Products like Loon, Deer Creek over time do in fact become cloudy. Solarez is the only one I've found to be consistently good. If I have time when I'm home - I'll mess around with some flies and photos to post here high-lighting what I'm describing. How do you get your Darbee Dun collars to sit back so neatly? 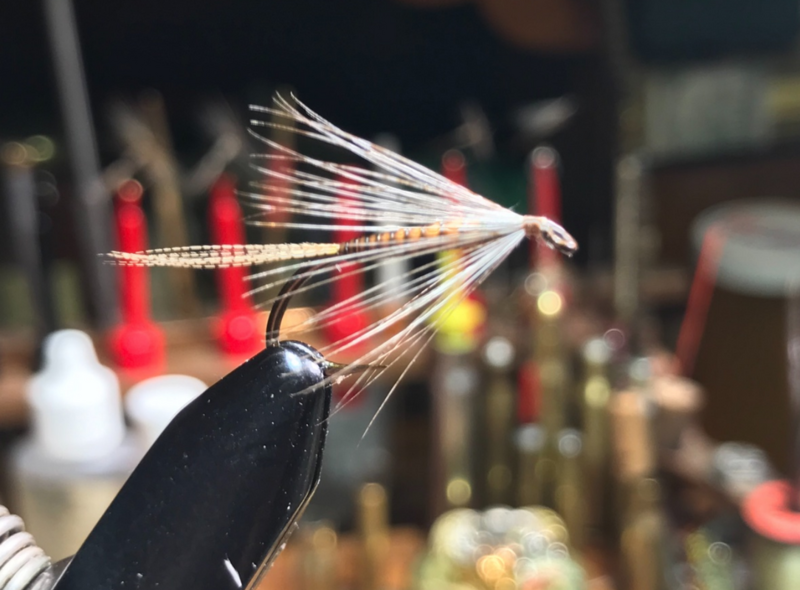 I haven't been able to replicate this result by folding back the hackle--so what's your secret? !